The Sudoku app for iPad! 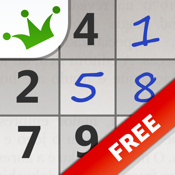 Download now Sudoku and discover what everybody already knows: Jogatina's quality is unmatched. You deserve to have more fun! And the best part is: IT’S FREE! Accept the challenge, download now. - Play WITH NO LIMITS! You can Play as many times as you want. - Undo Button. Here you can learn while playing! - Classic or advanced: choose your difficulty level! Install Sudoku now on your iPad!